Shenandoah Valley travelers now can fly directly to Charlotte, N.C., and then on to Orlando, Fla.
Shenandoah Valley Airport near Weyers Cave might be the smallest of Virginia’s nine commercial airports in terms of traffic — about 20,000 passengers a year — but the new arrangement with Maitland, Fla.-based ViaAir connects travelers with more than 700 flights. “This is the first time the Shenandoah Valley has had a partner airline offering daily commercial flights with a jet aircraft,” says Greg Campbell, the airport’s executive director. 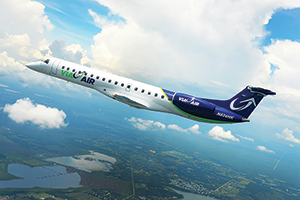 ViaAir will use a 50-seat Embraer ERJ 145 regional jet in flying to Charlotte and Orlando. Introductory fares to Charlotte start at $44 each way. Orlando fares start at $99 each way. Fares include one piece of checked luggage of up to 30 pounds. ViaAir, which boasts a 98 percent on-time performance record, will operate 12 weekly departures/arrivals to Charlotte. The Charlotte hub has approximately 710 daily departures serving 155 nonstop destinations. The Shenandoah Valley Airport averages about 70 to 80 takeoffs and landings a day on its 6,000-foot runway. “Five to six of those a day are commercial airlines. The rest are general aviation, primarily corporate,” Campbell says.